Simulated view of Rocky Forge wind project. The developer of what could be Virginia’s first commercial wind farm has lined up all the regulatory permits it needs, but it hasn’t started site work yet because it can’t find a buyer for the electricity. Apex Energy will not start construction by the end of this year, as planned, on the Rocky Forge project in Botetourt County, reports the Roanoke Times. I just heard the Guv on the radio this morning talking about how important renewable energy is to so many of the companies he is trying to recruit to VA. I totally believe that, especially with the tech firms. He was also touting the coming demonstration turbines off the coast, but those two turbines will be just that – nothing but a demonstration project of just 12 MW. The cost will be enormous (brace yourselves, ratepayers.) Disappointing that this more rational project is delayed yet again. Despite all the discussion over some time here on this issue.. I’m still not clear about it and if I’m the only .. I’ll just fess up to my own hard-headed inability to understand. I _thought_ that ANY generator of electricity could sell it through PJM and that the economics of it were what drove 3rd party companies to find sites, get them approved.. and start selling their generated electricity to PJM. So then it gets more complicated when we talk about the 3rd party folks selling their generation to a particular company that wants it. So like with Facebook.. why would they not just contract with some 3rd party like Rocky Forge to buy their electricity – instead of going through a utility like Dom? Clearly – I’m still ignorant about how this works.. Anyone care to shed my light on the issue for the hard-headed? Perhaps one of our experts can jump in and clarify this. I’m assuming that Apex can sell into the PJM wholesale market if it wants to, but the prices it fetches may not justify the investment. There’s a lot of cheap wind power in the Midwest. Therefore, Apex would be better off finding a buyer willing to pay a negotiated price. That’s my surmise, but that would have to be confirmed by Apex. A wind generator does have the option to sell to PJM, but that is at the wholesale price. It is more profitable for them to sell to someone like Amazon, using a Power Purchase Agreement, at a price lower than the customer’s retail price (saves the customer money) but higher than the wholesale price (makes more money for the generator). Dominion is negotiating special renewable tariffs for the tech companies. I have no knowledge if this is happening, but the unspoken arrangement might be for the tech companies to get their renewables from Dominion if they want this special rate. Jim, you and Larry are absolutely correct. But remember, there are three markets here: energy, capacity, and RECs. You have to keep these straight when talking independent, “utility-scale” solar development. PJM’s wholesale energy market, which is what every independent generator within the 12-state PJM region sells into, is happy to buy from Apex. What Apex will receive is the current (moment-to-moment) marginal energy price in that market. PJM gives no extra payments for solar energy; the energy is what it is. Wholesale generating capacity is the right to claim a generating unit as “yours.” These “capacity rights” are bought and sold by load-serving-entities, or LSEs, within PJM and similarly in every other regional electric “control area” in the U.S. Dominion is an LSE; so is Rappahannock Electric Cooperative; so is the Staunton Municipal Utility — that is to say, anyone selling directly to an end user is a retail provider and an LSE. An LSE must have arrangements in place to serve its total load “requirements”; usually those arrangements are: 1. it owns the generation; or 2. it buys the capacity rights to the generation bilaterally; or 3. it buys the capacity rights in the PJM capacity marketplace. Option 2, buying capacity, can include buying a commitment from the customer to shift load off the grid (either curtailed or onto customer-owned generation) when asked to do so. The entity that requires the LSE to have these arrangements in place is the federal-regulated North American Electric Reliability Corp. and its regional reliability council, backed up by PJM rules which require adequate capacity arrangements as a condition of the LSE’s membership in PJM. “Adequate” means equal to the LSE’s forecast annual peak load plus reserves to cover the risk of emergency outages and forecasting error; thus, most wholesale generating capacity is claimed on an annual basis (options 1 and 2 above). RECs are “renewable energy credits” which are bought and sold in bilateral transactions directly between generators and end users, or in markets facilitated by PJM and/or the State regulatory commissions. An REC confers the right to claim that a particular amount (in kWh) of “renewables” generation is dedicated to serving a particular retail customer’s total kWh. This does not mean that any portion of the customer’s load is constantly supplied from renewables generation as time shifting of kWh backed by RECs is allowed. These retail customers can be located anywhere in PJM and can buy RECs from any renewables generator (including Dominion) directly, or through any LSE that facilitates such sales, at a negotiated price. Indeed, Dominion (which wears several hats here: generation owner, wires owner, LSE, and billing/customer service provider) permits any of its retail customers to buy up to 100% “renewables power” (i.e., RECs) through Dominion at a pre-set price. OK, let’s translate this to the Apex situation. Apex can get the PJM wholesale energy price for its solar, the same as anybody else owning solar will receive (including Dominion). Apex can get the wholesale bilateral or PJM price for capacity too, but for solar or wind that’s relatively little cash, as these are considered “unreliable” because it cannot be counted on to be there as needed even during the day (for example, solar during storms, or wind during windless days); Apex’ 75MW has some capacity value, however, under complicated rules which give reliability credit for average solar and wind availability. Those rules, of course, apply equally to all solar generators. Finally, the RECs that Apex is creating here have value to retail customers who want to claim that their power is coming from renewables generation; the electricity, of course, is the same as all other grid electricity. Apex is competing with all other REC sellers to get the most for its RECs. Yes there is limited demand out there for RECs, but buyers can be anywhere in PJM; what is required is enough retail customers who wants a “green” reputation or otherwise want to encourage renewables generation to the point of paying extra for it. Data center owners, often with Silicon Valley or Seattle roots, are good candidates for this customer ethos. Apex is probably waiting to sell its RECs at the higher prices likely to result when new data centers in northern Virginia and Hampton Roads come on line. Why they don’t go ahead and finish their solar plant in advance of that, I cannot figure. I would quibble with TomH only that, in reality, bilateral power purchase agreements generally only cover the RECs — or, if they cover the capacity or energy output of the generator also, require special and elaborate contractual arrangements both with PJM and with the LSE involved. In general, despite a lot of “window-dressing” language about the customer “buying 100% renewables power,” the fact is that the energy and the capacity is commingled on the grid with everyone else’s and contractually the only commodity that changes hands with any certainty directly from generation owner to retail customer is the RECs. The Southeast is not a significant wind resource area, but offshore, shoreline and ridge-top areas in Virginia can generate reasonable amounts of power from wind. Wind generation results from the cube of the wind speed. So when wind velocity increases by a factor of two, wind generation is eight times greater. That is why wind energy generated in the Great Plains is cheaper than onshore wind energy in Virginia. I don’t know the price of the Power Purchase Agreement (PPA) proposed for this project. Wind is not as attractive to utilities that have nuclear generation because wind energy is usually cheaper than nuclear energy and is often most available at night when nuclear units are on a must-run status. Besides, Dominion wants to own everything themselves so they can collect the extra 10% from ratepayers for projects that are put in the rate base. The Co-ops in the state get most of their energy directly from Dominion or funneled through ODEC. So if Dominion doesn’t not want to buy it, others might not be interested either. Perhaps one of the data centers or tech companies might be interested. This is renewable energy and would also generate RECs that these companies need to say they have 24-hour supplies of renewable energy. Wind turbine technology is rapidly improving, just as solar technology is. so if someone is generating power – and wanting to feed it into the grid – do they have to pay the owner of grid to accept it? In a word, no — any independent generator gets paid for feeding into the grid, not the other way ’round. As I discussed above, that feed, the energy output of the generator, is one of three such payments from three different sources. The RECs are the other big source of income in this case. In the PJM region, PPAs between the customer and the generator simply don’t deal with energy and capacity very often, just the REC portion of the overall transaction. Let me clarify that answer to your question: the generator MAY be required to pay, up front, for additional grid facilities in order to connect to the grid (this would include upgrading transformers, extending lines, etc. as needed to accept the input). That payment will be more or less, or zero, depending upon the capability of the grid at the location picked by the generator. That’s why independent generation developers look for locations that have nearby grid substations with plenty of unused capability (as well as a fuel source nearby, if fuel is needed). But the generator will be paid by PJM for all the energy it inputs. And it will be paid by others for its capacity and RECs respectively. AC, maybe I’m mistaken, but the generator will pay something to the owner of the transmission facilities that carry its power. It can’t use the grid for free, right? I agree with all the comments that indicate that wind is a poor resource in Virginia. Any generation owner whose facility adds a new injection-right to the grid must pay PJM the incremental cost of facilities upgrades to accommodate that injection. Since these are incremental impacts, anyone who connects becomes part of a “queue” of applicants whose impacts are determined in sequence. These incremental, usually local, generator impacts can be hard to isolate when there are major transmission upgrades of the same facilities planned due to larger system needs; it is one of PJM’s responsibilities (subject, of course, to appeal to the FERC) to allocate cost responsibility for such dual-purpose upgrades between LSEs (who pay transmission rates for network service, but not for incremental load growth) and generators (who pay for incremental impacts but not for continuing transmission service). The application and queue process is laid out in the PJM transmission tariff on file with FERC. So, the answer to your specific question is, the generator makes a one-time payment to reimburse its initial incremental impact on the grid, but thereafter it’s a embedded use and the generator does “use the grid for free” as you put it. The entire cost of PJM’s network service is paid by the LSEs in each PJM zone — after all, the end purpose of the grid is to serve loads’ requirements reliably, without regard for where the power sources are located — and the total annual transmission revenue requirement in the zone is simply billed by PJM in proportion to each LSE’s share of the load in the zone at the time of the PJM annual system peak; PJM in turn takes that pot of revenues from the zones’ LSEs and pays it back out to all the transmission owners within the zone (who may or may not also be LSEs) based on their individual FERC-approved transmission revenue requirements in the zone. In the Dominion Zone, most of the transmission belongs to Va Power but the co-ops and munis own pieces here and there. PJM does not own any transmission facilities; it simply performs a billing/payment function for network transmission service, administers the connection queue, and oversees/coordinates grid facility maintenance outages and regional transmission planning. As LSEs, the Virginia munis and coops as well as Dominion are network transmission customers of PJM for the delivery of all of their retail customers’ energy requirements (there is a point-to-point PJM transmission tariff also which is little-used). Each LSE gets reimbursed for its PJM transmission bill from its retail customers as the LSE and its retail regulator(s) see fit. Okay, let me read all that again. There will be a test. Tom, Acbar, keep it coming – I’m soaking it in. It is fascinating that despite all the political juice behind wind, all the posturing, the economics remain so problematic. I assumed people would be waiting eagerly for a project like this one to come on line. Absent tax preferences, absent that REC revenue (sounds like a form of naming rights), what is left? Can you make money just producing power? Yes! That’s the point — Solar has gotten to be so cheap to manufacture that the main limitations are (1) finding a place near a power line with enough unused capacity to receive power so that upgrade costs are low, and (2) local politics of land use; economic subsidies are not needed for utility-scale solar any longer. For homeowner solar, tax credits still are the only way to get enough folks over the initial purchase hump — although TomH will tell you we should reject the pleas of the retail providers with exclusive territory rights and allow bilateral PPAs with retail customers where the solar equipment manufacturer provides/installs the solar equipment for free, then sells the solar energy to the homeowner (a “retail sale”) at a markup sufficient to recover over time the solar equipment cost plus a profit. RECs = “a form of naming rights” — yes; love that characterization! Some would argue that the social/political pressure on certain retail customers like Amazon or Mother Jones readers to “buy green,” which has resulted in such an active market for RECs across most of the Country, is a renewables subsidy in itself. This is true from an economist’s point of view, as the product actually being sold, electric energy, is indistinguishable whether it’s solar or non-solar sourced — but RECs are a fairly stable part of the political landscape and accepted today by banks as part of a solar project’s revenue stream separate from the wholesale energy market, where solar power is paid exactly the same as other sources, so I don’t think of RECs as a subsidy here. With that clarification, I don’t think the economics are all that problematic for new solar. Which is why we are going to see a lot more of it in Virginia. Acbar can you approximate the REC value of solar vs. the power value? Also I presume the “low” cost of solar assumes cheap imports of panels from China. The value of 1 REC (= 1 megawatthour of mixed renewables energy where 1 mWh = 1000 kWh) is not easy to find online as, it appears, by far the most active REC markets in the mid-Atlantic US are “SRECs” or solar-only. Here is a window into one of the most active State markets for SRECs, the one in NJ: http://www.njcleanenergy.com/renewable-energy/project-activity-reports/srec-pricing/srec-pricing Based on NJ, the price is running around $220 in 2017. Here is a PJM regional overview of all the mid-Atlantic states with REC markets (VA is not one of them): https://gats.pjm-eis.com/GATS2/PublicReports/SolarWeightedAveragePrice/Filter Enter the 2017 parameter here and this shows an average price per SREC of around $140 to $200, but with extremes of nearly $5 to $500. According to one report, SRECs tend to sell for somewhat higher prices than RECs generally and their price has been declining steadily as the amount of solar has risen. As of this moment (3pm on 10/27/17), the average price of energy PJM-wide was $23.78/mWh; Dominion’s average price at the same time was $28.15 (differences result from transmission congestion and losses between locations on the grid). This is very low for a midday price, reflecting the mild weather and low natural gas prices. In general the energy price ranges from the teens/low $20s up to the $100s or so — the energy price can spike much higher than that but usually only for brief periods. So we are looking at SRECs costing roughly twice or more the price of the underlying energy. Yes, there’s real money to be made in those REC markets. About those cheap Chinese solar panels: well, yes, but also they are imported from India and even Germany and we have domestic manufacturers too. variation as to what the infrastructure at a given location can accommodate without stringing more lines or new substations – and that costs… money. The electricity that some 3rd party generator is putting onto the grid – is not necessarily benefiting the utility that provides the locational connection. To add to the complexity, I read recently that another issue here was that often the market price for solar or wind goes extremely low or even into negative pricing because it was too often available in qualities exceeding demand ae certain times and places of high energy generation to the point that at times the price for solar or wind fell below 0 where the producer paid the customer to take excess energy off his hands, presumably to free up the grid. And that these too cheap energy markets caused significant disruption to other producers, even cases where regulators stepped into the market to stabilize it by their subsidizing other baseline producers so as to avoid their shutdown of critical baseline plants. Thus, apparently, some areas like West Texas and California, as I recall, can produce “too much solar” for market health at times. Of course in Germany, where the government forced the permanent shut down German nuclear plants after the Japanese Tsunami incident, there suddenly arose an unexpected need to quickly build altogether new coal plants forcing the use of dirty German coal to fill the unexpected short falls and market inefficiencies and dislocations given the then faulty mix that overloaded renewables by fiat into the German market. This is my best recollection of these articles I read a month or so ago. Perhaps the experts can clarify or correct. You are correct. The wholesale marginal energy price can “go negative” — this was true back when nuclear power was new and it is true once again where solar or wind power exceeds what the grid can absorb. The reason is slightly different: in the case of nuclear, the marginal cost of energy from nuclear generation is low but not zero; however the cost of dispatching a nuclear unit off-line is VERY HIGH and takes a long time, so a nuclear gen. owner would be desperate for any other generator to back down first (or for some new load to come on, like pumping water up-hill for pumped-storage); whereas, in the case of west Texas (mainly wind but some solar), or California (mainly solar), the marginal energy cost is truly zero and the source is usually non-dispatchable (there’s not even an operator on-site) so the grid operator has to look for ways to “dump power” (pay other connected grids to take it, for example) to avoid shutting down other, hard-to-cycle, fossil-fueled or nuclear units. One other comment — I believe there was still some German nuclear generation on-line fairly recently, and still may be; but it’s being phased out and solar is being promoted aggressively. You are absolutely right, this was in deference to the anti-nuclear scare-mongerers and, on balance, is harmful to the cause of reducing carbon emissions. As a rule-of-thumb, renewables generation generally makes economic sense up to around 30% of the total but beyond that the costs of what you back it up with start to rise as the consequence of more cycling on-and-off and those inefficiencies negate the benefits of the lower-cost renewable energy. In a free market, we shouldn’t forbid more solar than that, but shouldn’t over-promote it either. The “fee” you are talking about is an upfront reimbursement of the cost of grid upgrades — if any. As you say, that’s a location-specific determination. There is no other upgrade fee. There is no continuing fee imposed by anyone that I’m aware of, although if a dispatchable generator wants to connect there are communications equipment requirements and some of that equipment may be leasable from PJM or Dominion for a monthly charge. The up front upgrade cost would be determined by, and paid to, PJM if the generator was planning to sell to the PJM market (which any generator can do), and PJM would reimburse Dominion’s upgrade costs if any. If the generator was planning to sell to Dominion, it would reimburse all grid upgrade costs to Dominion under Va Power’s tariff and the related SCC rules. In theory Dominion might have to reimburse any other affected utilities, and would do so through PJM, but any generator selling its energy to Dominion (rather than to the wholesale market) would probably be so small that its input would not affect other utilities. Donning a bright yellow reflective safety vest, hard hat and gloves Thursday afternoon, Gov. Terry McAuliffe helped install the last of 235,900 solar panels covering just more than 100 acres in Remington. Microsoft would buy Renewable Energy Certificates from Dominion to help fund construction of the generating facility, with 260,000 solar panels, along Lucky Hill Road. Under a 25-year contract, the Commonwealth of Virginia would buy electricity from the plant at a reduced rate, saving taxpayers $1 million over the life of the agreement, Dominion Vice President for Business Development Jim Eck said in a phone interview Wednesday morning. The amount of Microsoft’s investment — also over a 25-year term — remains confidential, Mr. Eck said. The Dominion executive added that the state and Microsoft, which has a huge data center in Mecklenburg County, rank among the utility’s largest customers. Both customers have goals for increasing renewable energy. This sounds a lot like the recent Facebook deal except the REC was formalized with the Facebook deal. So.. if you look at this over the longer run – it appears that Dominion is now working directly with data centers that want renewable energy – rather than have those companies make agreements with 3rd party providers. So Jim is pretty good at helping Dominion tell their side of the story but on this issue – it would be nice to get a more independent assessment of Dominion’s changing role in solar – to directly provide solar to companies rather than standing aside and letting 3rd party providers do it. In doing this – I wonder what effect that change has had on the ability of 3rd party providers to put up wind/solar for RECs if Dominion is now the dominate player in that game. The other interesting thing about this solar is that it is co-located next to a Dominion gas-fired power plant which does give the opportunity to link the solar and gas via computer to use the gas to keep the output – reliable – while at the same time using solar and saving gas – when they can. Would love to see Jim blog about this aspect and get Tom, Acbar and others “take” on the project – both from a RECs and the co-location of solar next to an existing gas turbine plant. I have been occupied with other projects and have missed much of this conversation. Thanks to Acbar, you have been provided a great deal of useful information. Dominion has flipped considerably on their support for solar in the last year or so. Perhaps because most of the load growth is coming from data centers and the data center owners want to be supplied by renewables. They also now recognize that solar is a lower cost method of generation compared to conventional options. I happen to favor having the option of third-parties being able to contract directly with customers or to utilities without the 10% rate of return being added to the cost for utilities, when the utility provides no value added. That is allowed in Virginia only if the utilities do not have a special tariff for renewables. Dominion has developed several. APCo has developed one that is so flawed that the SCC has not yet approved it. There are several drawbacks to keeping solar primarily under the control of the utilities. First, it adds at least 10% to the cost, as I mentioned. Second, it prolongs the 20th century model of central station, hub and spoke utility design. This scheme disrupts more land, requires more transmission, misses out on the added benefits to grid reliability and resilience offered by distributed generation, and substantially forecloses opportunities for third-parties, who are the primary innovators, cost reducers, and job creators in the energy sector. I understand why utilities are doing this. They are still governed by the Build more – to Earn more regulatory scheme. Forward-looking states are revising this formula to encourage utilities to build a modern grid and a transactional system from which all parties benefit. We could do that in Virginia too, for the benefit of all, not just a few. The co-location of the solar with the gas-fired plant provides no benefit to the grid operator. Both facilities are under the real-time supervision and control of the grid operators regardless of their location. There might be some land use benefits, by having two disturbed land uses from energy projects in one place rather than two. They also likely share access to the same transmission corridor, although this makes them more vulnerable and potentially less reliable. The scenic impacts for the solar are about the same as the gas power plant.. This complex includes a second gas power plant less than a mile away and all of it is about 40 miles from NoVa. The photo found at https://goo.gl/maps/eoUPGgYE1RL2 enlightens. The next step of your research project might be to compare the amount of power generated by the solar panels to the amount of power generated by the gas plant next door. Having figured that out, you might multiply the size of the solar plant’s energy production by the number of times the power production of the gas plant exceeds that of the solar project. Then, armed with the multiple factor showing the land efficiency use of gas plants versus solar plants, use that same multiple to calculate the amount of land the would be eaten up in Virginia should the state go 100% solar. Then keep backing off that number by decreasing the share of solar until you get an acceptable land use number. Is it 80%. 60%? 40%? 20%? None? Remember when doing this you have to add on top of all the land under solar panels, the additional land you will need devoted to gas plants to keep the grid reliable due to the unreliability of solar, an unreliability factor that will increase with the increase in solar. How can we satisfactorily ameliorate this otherwise vast appropriation of natural lands to use of steel and glass solar panels and gas plants needed to support them, in ways that protect Virginia’s environment while gaining for the state the optimal benefits of renewable energy? And be sure to add transmission lines as well. There is so much unused and vacant land in the rural areas these days that it’s not funny. Take a trip 50-60 miles outside of NoVa and you’ll see hundreds of thousands of acres of land. In terms of the amount of land it “uses” – compare to all the powerline and pipeline rights-of-ways.. needed to serve NoVo. Do we count those impacts in the same way we might solar? Those gas plants in Remington are fed by pipelines… which if you look at the total amount of land used for the pipeline right of way is substantial. But do you even notice when you’re driving ? You probably don’t even see the pipelines except where they cross roads and mountains, right? The goal of solar is not to replace gas …. . It is to use solar when it is available so as to be able to use less gas and if there is no solar available – then 100% gas. But there will be times when solar can reduce the amount of gas needed. Think of it like you would a hybrid car which switches between battery and gas. In this case – the “battery” is the solar.. and you use the solar when it is available; it will never be a primary fuel but it can decrease the amount of gas needed – and extend the time that gas will not become more scarce. The military is interested in this .. especially in remote areas where their operations are not on a grid…and they have to transport fuel to keep the base running.. The less fuel they need to transport – the better.. The more they can extend their supplies of fuel by using solar – the better. I agree with your concern about the land occupied by large-scale solar facilities, but you are not making an apples-to-apples comparison. First, a gas-fired power plant occupies far more land than just the building footprint. The substation, parking lots, auxillary buildings, and the surrounding “green” areas have all been foreclosed to other land uses. You also have to account for the plant’s proportionate share of the thousands of acres required for pipelines and fracking zones. What you see for the solar facility is all that is required. For the gas-fired plant, most is hidden from view. Land use disruption is not an inherent quality of solar. It’s just the way our utilities are chosing to develop it. If we were free for third-parties to develop solar in a way that most benefits customers and the grid, a majority of installations would go on commerical, industrial, government and institutional buildings, parking lots and adjoining land. This would not disturb what will sometime be valuable farm land again. Or be a disruptor of pastoral rural landscapes. Distributed solar results in lower overall energy costs and contributes to a more reliable and resilient grid when sited in the most important areas. The extrapolation you propose would be interesting, but needs to be weighted: space required x amount of energy in mWh generated annually. In fact the combustion turbines shown in your picture of Remington are run only rarely by Dominion as they are high operating cost units, and so the power produced per acre probably is superior on the solar side. But I expect, looking at all the generating sites worldwide, etc., solar is profligate with land consumption, no doubt about it. The only saving grace is, solar arrays are easy to remove and leave no contaminants, if there is ever a need to reacquire the farmland. I must add, the solar arrays I have seen under construction in Virginia were being installed on land that had been abandoned and choked with scrub growth. We haven’t reached the saturation levels necessary for developers to search for rooftops instead of abandoned fields to build on, but that day will come. 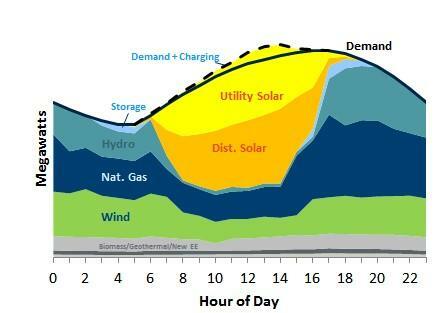 Another thing that we don’t know – that Dom does.. is what percentage of demand is provided by baseload? The reason that is important is because the next question is – what kind of generation covers the demand that is not met by coal and nukes ( and combined-cycle gas). That’s important because solar and wind are ONLY relevant with respect to their contribution to the generation that fulfills demand above the baseline – baseload (coal and nukes). I’ll be honest. I have no clue. But I suspect the 30% renewable number that is often stated as the max amount that is feasible – has to do with the demand that is “above” the baseline – the generation provided by 24/7 baseload. What determines how much baseline baseload that has to be provided? Could ALL baseload be provided by combined cycle gas instead of coal? Is that DOM’s essentially strategy? Reed – let me try to convince you of the land-use issue. A plant that uses gas – and gas is way more energy dense than solar – but if you really want an apples to apples comparison on land required for each of the two – you need to include the land that is cleared for pipelines to provide the gas. then divide that by 640 (acres is a square mile) and you get 1500 acres per mile of gas pipeline right of way. multiply that by .. say 200 miles and you get 300,000 acres … which if you then divide it by 640 to get square miles – you get over 468 square miles or a parcel of land 21 miles on each side. so that’s your apples to apples – land-use comparison. would a parcel of land 21 miles on a side – 468 square miles of solar be equivalent to a gas plant? and if you spread that land out in a linear fashion like you would a pipeline right of way – or a railroad right of way – would it be any less or more a scenic impact? check my math .. make sure.. I did it right but the Fauquier Now news article reports 20 MW on 125 acres.. so 4 times that would be 100 MW on 400 acres. I will get back to Larry and Tom’s comments, and those of others in this very interesting conversation, likely on Sunday, as I am traveling until then. Be careful about considering “baseload” as a type of generation. It is actually a characterization of a type of demand. With an increasing array of demand side management tools and numerous ways of shifting loads to other times of the day, our conception of “baseload” is radically changing. In addition to the higher costs, coal and nuclear generation is extremely inflexible in its operation. This decreases their value as contributors to the modern energy grid. This fact is often overlooked or ignored by their proponents. With innovation in electricity and thermal storage, remote-controllable heating, cooling and water heating devices, we have much more flexibility in matching demand with changes in supply. What you are describing was accurate in the 20th century. Not so much in the 21st. Recent studies by NREL and others are suggesting that renewable penetration of 80% or more might be realistic and reliable in the next 20-30 years. Obviously, numerous advances in cost and technology must occur for that to take place. We are accustomed for our energy technology to remain fairly static for 100 years. Edison would recognize most of the devices in use today. Tesla would be disappointed that we have made so little progress. Now that our energy systems are beginning to enter the digital age, energy technology will improve by leaps and bounds every decade. With moderate levels of energy efficiency already being achieved by many states, Dominion could retire the 60-year old nuclear plants in the 2030s, and maintain Mt. Storm at its carbon-compliant 40% capacity factor (available as spinning reserve for the combined cycle units) until its retirement. In this scenario, the combined cycle units already built or under construction (Greensville) would be sufficient to meet Dominion’s baseload demand for the next 20+ years. Payment schemes would require adjustment to keep the utility financially healthy as its rate base diminished. Ratepayers would experience significantly lower energy prices compared to the path we are on. Sorry .. how do I make an image show up here? Is Dominion actually oversupplied if Virginia required and funded efficient buildings and Dominion picked up on DR now accepted by PJM? these are good graphics.. the only way I know how to get images to appear here is if you can locate them on the web and then use the address to them). I’m on my way out for a couple hours and will have to get back but perhaps to get away from the term baseload – think about what provides the power for the grid between 10 pm and 5 am.. when the demand is probably at it’s minimum. I don’t think solar can do it and I doubt seriously that we have enough wind to do it…so what else do we have? Do we have enough gas to burn it 100% between 10pm and 5am? The answer … demand can be cut in half by 2050. And more about the value of building efficiency and efficiency in general … PJM is now rewarding efficiency projects in the forward capacity market, providing a new source of revenue for efficiency projects. Virginia is at or near the bottom of states that support efficiency projects and PACE loans that provide funds are just now getting started. Dominion’s demand projections should start including what is happening to demand everywhere. but I sorta see a static baseline demand.. in other words – the absolute minimum demand that maybe is seen at 2 am.. and some percentage of it – perhaps all of it and then some – is met by inflexible generation – nukes and coal..
then as the day moves on – demand increases and other generation is brought online to meet that demand… and that generation needs to be “flexible”.. i.e. it can dynamically vary to respond to dynamically changing demand. What you are saying – I think – is that demand is changing – perhaps reducing with the advent of more energy efficient “stuff” such that – perhaps the absolute minimum demand at 2am is , itself, reducing and the need for a certain capacity of baseload is decreasing . That was one of the questions I had shot at you in an older thread – what is the minimum demand on the grid and what is the maximum demand. Is maximum demand .. twice what the minimum demand is ? 3 times? 1/2? whatever it is… it’s only the demand that is ABOVE the minimum (which can be met by inflexible baseload) … that can be met by “flexible) generation – which can dynamically vary in response to varying demand . Solar, when available and usable – can meet some of that varying demand – if the gas generators are able to also compensate for solar variability. or perhaps you can sort of lay out a operational concept that better explains how baseload coal/nukes work with gas – and solar. It’s not possible for me to display the load duration curve with this post. You can find it on page 102 (Figure 5.5.5.2) of Dominion’s 2017 IRP. I am making a crude approximation, because the axis is labeled every 5000 MW. The load that is experienced 100% of the time is about 7,500 MW. This minimum load would occur in the mild weather periods of spring or fall. The baseload during summer and winter peaks would be higher. so the info you posted is much appreciated. 1. – that it’s “forecastable”… by season or time of year to a certain extent. 2. – that they do have enough “window” to ramp up the inflexible fuel generators to cover those loads. but then the other question would be for everything that is above the “base” what fuels are suited to do that? We will make a utility planner out of you yet! play together to provide a reliable and functional grid. it seems to me – anything above “base”… i.e. intermediate and peak – has to be provided by “flexible” generators… and those generators are primarily gas… some plants might be combined-cycle and capable of adding to the “base” by running continuously 24/7… but they are also capable of lowering or increasing their output.. or just shutting down -then powering up later. They do that in response to demand.. which the inflexible/fixed generators cannot do… at least quickly or easily so that’s why I ask what the base demand is because if that demand is known and predictable then it can be met by inflexible generators.. coal and nukes.. Okay so it’s this general area that I’m still not quite understanding… and I feel like an understanding of that is necessary BEFORE we talk about mixing in renewables …. which are actually worse than inflexible base because it cannot be “controlled”.. you just accept whatever is available when available – if you can. Your basic understanding is right on. TomH is correct that “baseload” is a descriptive of load, not of the generation that serves it, but as a shorthand term utility people often refer to “baseload generation” just the way you did. The Brattle Group graphic you posted is a one-day snapshot showing the potential effect of renewables on that day’s load curve. The main thing that’s missing there is the fact that the daily load curve also is affected by the season of the year and by extreme weather. Most people mean by “baseload generation” the generation built to run 24/7 at any time during the year, and that window of opportunity may be much smaller at some times of year than others. Increasingly utilities and independent generators are trying to blur that line by building, for example, NGCC (nat gas combined cycle) units that run most efficiently 24/7 but can be run with relatively little loss of efficiency even if cycled off occasionally. And as discussed elsewhere, utilities with a big investment in non-cycleable units, like nuclear and coal, are looking for ways to “cycle” their output into storage when the grid doesn’t want it. And it helps to remember, solar may not available at all during extended periods of bad weather such as winter “polar vortex”storms. What the Brattle/NRDC report shows, perhaps unintentionally, is how difficult it becomes to absorb too much solar and wind power if you have don’t have enough other generation on the grid to cycle off or storage to absorb the excess. (One form of storage we haven’t discussed much, and that’s electric vehicles — they will play a big role if they become a large portion of the transportation stock and if people can be induced to charge them at the times that help the grid best.) Up to 30% renewables or so the grid can handle currently, but more than that and your questions become crucial. That 30% is a ways off; but I’d like to see a lot more of that in the form of distributed (homeowner) solar, and that means promoting D.G. before the 30% “window” is filled up by the big utility-scale projects being planned and built these days. Okay – so pretend you have no gas and all you have is coal and nukes – what percent of renewables can be used? I’d start by asking, what is the load just after sunset? That’s when folks are just home and cooking dinner and washing clothes etc and many stores and theaters and restaurants are still open too. Its maybe not the highest load on a summer day but it will be the highest in winter. And there’s no sun. Ok, that’s the daily max you will usually have to cover without solar resources. Now, how low will it go later that night? That’s the daily minimum. The difference is what you must have cycling generation for. The amount of generation below the minimum will not have to cycle off. Now, do this for every day of the year taking changes in the closet, the sunrise and sunset, and a reasonable range of weather into account. That’s what the grid operator has to plan for. The owner of each generating unit has to hope that his will be called upon to run frequently enough to make a profit. If the unit runs cheap, it will be dispatched early and often. If it runs really cheap, it will be among the last cycled off. But even units that aren’t built to cycle can be taken offline quickly; the problem is they are very slow to come back, and customers on the grid lose from not having the cheap energy pouring out during that extended ramp-up time (for hours, or for nuclear, days). Sometimes a unit can be kept hot and its generator spinning and sychronized with the grid but without carrying load (“spinning reserve”) — this is expensive but may be less expensive than taking the unit offline and then brought back online hours later. The system operator (PJM) knows all this and runs the computations to figure what is the cheapest way to meet load given the forecast of load changes over the next few hours and what combination of adjustments including taking units off line for cycling and loss of a unit’s output during ramp up times will allow total generation to equal total load cheapest overall over those hours. In addition — The maximum amount of solar without causing issues is also limited by the impact on system ops of suddenly losing a large chunk of generation. Like when a cold front rolls through and that sunny day becomes rain simultaneously across a WIDE area. The larger and more concentrated the resource and the more suddenly it can disappear, the more elaborate and extreme the back-up plan has to be, including lots of very fast start cycling/peaking units which must be kept ready to run on a moment’s notice. At some point those back up preparations to maintain reliability eat into the cost savings from the solar. I don’t know exactly where that point is on PJM’s grid, but 30% is a rough threshold for concern I continue to hear. yes… but was not thinking of solar – was thinking of a conventional grid with no gas – no “cycling” generation to speak of … or perhaps oil only. That might have been the grid 50 years or more – ago – when gas was scarce and (I think) not generally used as cycling generation. I would have surmised that the coal/nukes would keep on burning fuel 24/7 – with many plants having multiple turbines and those turbines – in low demand periods – would simply be “idled” … so you really could “vary” output but it only helped the grid per se – not the consumption of fuel or in the case of coal the pollution it was creating . so that was an era not only prior to solar, but largely prior to the widespread use of gas as “cycling” generation. Additionally an era prior to PJM? and I further (perhaps wrongly) surmise that when PJM came along that by coordinating the grid and it’s load – they could minimize the number of “idling” plants ..i.e. rather than have 3 plants with 3 turbines and all 3 having to idle one turbine.. just power one day and let the other two run flat out 24/7 – the net result – less waste and pollution. I think (maybe not for everyone) if we understand how the grid functioned without flexible/cycling generation – then we might better understand how gas and then wind/solar got mixed in. The days you are talking about were in the 50s and 60s. Power plants were much smaller, so adjustments to load could be made in smaller increments. The primary baseload units were coal-fired, with gas or oil-fired units to fill in more variable loads. Legacy hydro facilities from early in the century also helped with variations and the peaks. Demand was more predictable because most people (except for factories) worked 8-5 and stores were open only one night a week. Regional power pools were just getting underway. I remember working summers in the gas and electric dispatch center deep underground during my college years. One of the first fax machines was put to use to improve data exchange between the two major utility dispatch centers in Michigan. The readouts were mostly analog. Under those conditions, they still were able to manage load variations reliably. Although, there were probably wider frequency and voltage variations than our modern electronic devices can comfortably cope with today. In the 60s nuclear came along in a big way. Economic considerations required them to be large facilities (1000 MW+). By the mid 1970s, the declining cost character of the electricity system changed. Since that time, every time we add a new conventional generating station, the cost of electricity goes up. Because of the relatively few alternatives to electricity use, utility executives and regulators failed to notice the fundamental shift in their business. In the 1970s, most of ConEd’s units were oil-fired, because it was impractical to bring coal trains into New York City. The price shocks due to the oil embargo caused them great distress. In the last 40-50 years we have become a 24/7 culture. We experienced more varied work hours, stores were open at all times of day, air conditioning spread throughout the country, and using electricity for water and space heating became more prevalent. Then came all of the electronic gizmos. And natural gas became more expensive. The fixed, must-run nature of the nukes brought in large-scale pumped storage where appropriate terrain was available. The more variable demand made it more difficult to manage large, inflexible sources of generation, but the expanded regional interconnections between utilities dampened much of the variation. In this century, significant amounts of low-cost solar cut into the need for baseload generation during daytime hours, making life difficult for inflexible sources such as nuclear and coal. They were also experiencing greater price competition from low-cost natural gas. It is unlikely that anything besides more subsidies will cover the increasing cost disadvantage of coal and nuclear. We must plan for an economic and reliable phased retirement of these units, because their inflexible character is no longer a good match for the variations in a modern grid. Renewables will continue to decline in price. Similar declines in storage of various types will help to deal with their intermittent nature. But as Acbar has pointed out, we still must be able to deal with prolonged shortages of renewable output during severe weather events. Many of the older, less efficient gas-fired intermediate and peaking units are likely to be used less and less. But they can be kept in reserve, still earning capacity auction payments for their owners (plus other returns for rate-based units). These units can be a reliable backup during the longer periods when renewable output is forecast to be less than expected. You ask what did PJM change in all this. It used to be that each utility generated to meet its own load. The utilities were not even interconnected, as that requires the exact synchronization of the interconnected systems to keep them “in phase.” So, each utility built its own spectrum of baseload, cycling and peaking units to meet its own load forecasts. This of course led to some inefficient overcapacity and to some emergency shortages, both of which could have been ameliorated if the utilities were interconnected. In the period from the 1930s to 50s the interconnected grid was created: the first of the giant transmission lines capable of interregional power transfers were built, and the existence of the grid allowed utilities connected to it to reduce their individual operating reserves. A few utilities even undertook to build nuclear power plants much bigger than they needed for themselves, planning to sell their excess power to their neighbors, and others planned to lean on the grid and buy an increasing amount of their requirements rather than build anything. But in most areas there was no formal market for sales and purchases, or formal arrangement for coordinated operations, except in two portions of the country: in the northeast, the coordination required to support electric power to the electrified railroads caused the utilities to band together in “power pools”; and in the far west a similar coordination was driven by the seasonal abundance of hydro power. The PJM power pool, initially formed in 1927 between NYC and Philadelphia, expanded by the 1950s to Washington; but the Virginia, NC and SC utilities would have none of it; meanwhile the deep South (GA/Al/MS/LA) became highly coordinated because there was basically just one utility running the show for maximum efficiency (the Southern Company). Other pools were started across New England, in New York State, and another massive single-company coordination area arose in the Midwest (under American Electric Power). In the late 1980s, the federal regulatory agency FERC felt the time was right to develop wholesale markets using a common national approach to energy markets. One reason was, there was a big push by independent generation developers to ensure that those who ran the grid and owned the transmission would allow grid connections on fair terms and in operating the grid wouldn’t discriminate against generation they did not own. The rules FERC came up with required the existing coordinated systems, including the old pools, to become “independent system operators” governed by their own membership. PJM was one of those. The rules also required the utilities not already in one of those existing coordinated systems to join one (or create a new one). Dominion chose to join PJM in the late 1990s. PJM runs a single “control area” now covering 13 states and within that area all generation is dispatched economically (lowest-bid-price first, adjusted for transmission congestion and losses) within the limits of what the grid will safely allow (“security-constrained”). PJM ignores who owns the generation and dispatches all of it as though it were one giant machine, for maximum efficiency and lowest cost to all customers. Because generator owners are treated alike, there are many independently owned generators operating in PJM now; also ODEC and the Corps of Engineers and Virginia Municipal League members all participate in this joint dispatch under PJM direction. All the LSEs in PJM also participate in this; these include all the REA cooperatives and municipal systems within PJM as well as the shareholder and private utilities. A utility that is both an LSE and a generation owner is still subject to PJM dispatch. If a generator is dispatched to run, it is presumed to be selling to the market; if it’s a utility owned unit and doesn’t run the utility that owns it is presumed to be buying from the market. If someone wants to make money in the generation business, they must build a highly efficient generating unit of whatever type it is so that PJM will dispatch it more often and at greater profit than competing generators. And, there is no advantage to an LSE that buys from generators owned by the same company as opposed to anyone else’s connected to the same grid. Most States around this time, including Virginia, began requiring utilities to break down their bills to retail customers to show the generation/purchased-power charges and wires charges and customer/billing charges separately. Some States went the extra mile and allowed retail customers to buy from competing suppliers — with mixed results. The whole point of allowing competition between suppliers was to free the regulator from having to set cost based rates for market based retail sales; however, in many markets the retail rate was already so low that other suppliers did not try to compete, and without competition, how could the market be said to set the rate? Moreover, most States have made the local supplier of distribution services the “default” retail supplier at cost-based, not market based, rates. This begs the question: should the default supplier be required to charge a rate higher than its cost just so competitors could offer to beat it and thus develop a competitive market? If not, shouldn’t the default supplier have the certainty of a continuing relationship with its customers for planning and branding and cost-based-rate-determination purposes? Virginia wrestled with this for a while but then abandoned “retail access” almost entirely. You add, “I would have surmised that the coal/nukes would keep on burning fuel 24/7 – with many plants having multiple turbines and those turbines – in low demand periods – would simply be “idled” … so you really could “vary” output.” No it doesn’t work like that. Most large boilers (including nuclear, oil and coal heated boilers) make a certain amount of steam when running; they are on or off — you can’t ramp that amount up or down. So if you don’t use the steam in one or more steam-driven turbines, you can’t cut back just a little but must literally “waste” it (vent it or re-condense it). A “gas” combustion turbine or CT is a little different: each turbine uses only the fuel that’s injected into it, so the plant size (number of turbines) is scalable, and such units are quick-start and quick shut-down (cycleable); but once you add in such features as “combined cycle” heat extraction and recirculation etc. you increase the start up times to reach efficient operation of those features. That’s why NGCC units are considered cycleable but not nearly as efficient when used that way. I think your answer is, you can’t have a modern electric grid without cycling units. The question is what kind, and what proportion of the total generation, not whether cycling can be avoided. Yes, PJM can better coordinate the efficient use of all those different units to achieve the lowest cost energy output, in part because there will be fewer units across the grid which are partially loaded. but if a unit is no longer carrying any load at all it will be shut down. The system operator doesn’t hold any generating units “idle” on hot standby except in cases of imminent system emergency, or some other very specific operating requirement like a local instability or lack or sufficient reactive power. If you were on an island with an isolated set of generators lacking any with cycling capability you would do what you had to do to meet load, but it would be so inefficient as to increase costs drastically and unacceptably, so much so that somebody would build a cycling unit on the island as soon as possible. Great history lesson, AC. Let me address a couple of minor nits. As I understand it, part of Virginia has been in PJM since its founding back in 1927. That would be the Eastern Shore, part of which was served by Delmarva Power & Light, one of the founders of PJM. You are correct that most of the state refrained from joining, but was a frequent customer of, PJM until state law required such membership as of July 1, 2005. Of course, Apco was a part of the massive AEP power pool that dominated service in the Midwest and relied nearly entirely on coal-fired electricity up until very recently. I believe AEP developed one of the first, if not the first, large-scale interstate transmission grids to deliver power from massive coal plants along the Ohio River to customers as far away as Northern Indiana and western Virginia. Also, I do not understand all its many nuances, but I believe that the PJM dispatch cannot really be said to be least cost, since it relies on bids into its markets for both capacity, in auctions that occur three years prior to delivery and for energy which occurs in daily auctions. It selects the group of lowest BIDDING generators needed to meet the expected demand, but pays each bidder the price that the highest bidder among the selected group has bid, i.e., the clearing price. Thus, PJM’s dispatch replicates, in some ways, least cost supply, but not exactly the way a single utility supplying itself would necessarily dispatch. This bid-based system is how, in part, renewable power supplies sometimes drive the price negative–they can bid zero or even below zero because they receive production tax credits outside the market and can run at zero or below and still make their money. I should clarify that state law did not require that DVP and Apco join PJM, only that they join an independent system operator. They initially, along with several other like minded utilities, tried to form a new organization to be called the Alliance ISO, but after granting a number of initial approvals, FERC abruptly reversed course and denied the Alliance’s application and required each of its prospective members to join either PJM or the Midwest ISO. Most ended up in PJM. By happy coincidence, the then-chair of the FERC ended up employed by Exelon, the gigantic Chicago based utility, whose operations between Chicago and its newly acquired utility serving Philadelphia would have been “tolled” by transmitting power across the Alliance. Its wonderful how things just work themselves out like that…..
I’ve been busy with other things and let this old thread lie fallow, but thanks for reading it and I’ll make one more comment here. You are correct that the AEP system pioneered bulk power transmission as we know it. Perhaps in imitation of that model, the PJM power pool companies jointly built a similar bulk system for the purpose of delivering the output of two jointly owned coal plants in western PA (the Keystone and Conemaugh units) and for sharing the nuclear output across PJM. The AEP backbone is 765 kV whereas the eastern EHV standard is 500 kV (roughly 2/3); the Midwest also uses 345 kV where it’s 230 kV in the east (again, 2/3) – I believe that’s because New York and New England had already chosen 230/500 kV and PJM companies had more interchange with them, at least initially. Dominion and the NC companies also went to 500 kV over time, reflecting their de facto coordination with PJM. I was there when DVP was checking out its ISO options. Early on, there was talk of how to fill the void between PJM and Southern Company. The big problem as I recall was Duke’s and (then) CP&L’s reluctance to work together on just about anything. The logical geographic grouping would have embraced SC and NC and VA up to AEP’s border, and Alliance might have achieved part of that, but it was too little too late; FERC was on a roll with ISO-NE and NYPP and MISO and PJM all of which had a market and operational track record at that point, and the SCC was OK with that. Also I remember hearing that FERC was afraid to try to let AEP form its own ISO but felt any entity that took on AEP as a member would have to be the dominant in order to remain independent, and with AEP that’s hard to do; therefore pushing DVP and Com Ed and DQE etc into PJM and the NC companies into MISO was a way to lay the groundwork for AEP to join one of them without dominating it. Who knows, maybe Exelon’s desire to integrate further played an outsized role too — although I believe the old Com Ed and PECO retail areas remain separate LSEs with separate capacity obligations and energy requirements even within the larger PJM, so direct energy transfers subject to transmission “tolling” by Alliance would not have been the principal result of Com Ed not joining PJM, so much as a different energy market price curve in both smaller energy markets, perhaps resulting in less operating profit for Exelon’s nukes. You are of course quite right about the energy market paying the marginal (clearing) price not the bid price. And there’s the locational factor for security-constrained dispatch limits (congestion) and losses. And there are startup and shutdown costs, and ancillary markets for spinning reserve and reactive power and quick start power and FTRs and so forth. The capacity markets are a whole ‘nother complicated story. Yet I have heard the economists argue that the ISO model is economically efficient and “least cost” in the long run, such that if the result is not exactly as a single utility would have done things, then it’s the latter’s inefficiency to blame. At least, that’s the goal. One minor bit of history. PJM was founded by PSE&G and PECO. As the Pennsylvania RR electrification grew, they added BG&E, PP&L and the GPU companies; later DP&L and ACE and Pepco joined. The name “PJM” stands for “Pennsylvania-New Jersey-Maryland Interconnection” (the original name was “PNJ Interconnection”). Originally the Virginia eastern shore was served by the private Eastern Shore Public Service Company and some municipal and coop electric companies, then ESPSC became part of Delmarva Power, which was a holding company with subs in VA, MD and DE. Delmarva bought Atlantic City Electric and PECO’s MD territory; then Delmarva was bought by Pepco; then PECO, which had become Exelon, bought Pepco ( as well as BG&E’s parent, Constellation). So it’s one big happy Exelon family from DC to Philly and Atlantic City now, although they play that down somewhat. Meanwhile, I believe Delmarva sold its Virginia retail service territory on the eastern shore to A&N, the electric coop in Accomack and Northampton counties, partly to simplify regulatory costs. Delmarva still owns some 230 kV transmission facilities over there. Acbar – you should write a book on this industry, a history of its evolution, and related matters. It’d be well worth the read. Well I read through both – won’t remember all of it but will retain some and appreciate the time and effort you guys put into it.. and hope others also benefited. Tom did a good job explaining how the generation and grid has evolved over time. If you have a nuke or coal unit running at some level 24/7 … and you don’t need the power it is produced.. how do you keep it from getting onto the grid? Don’t you just not use it to drive turbines? I think part of the issue in trying to understand this is the difference between thinking in terms of one power plant serving one local “grid” (like a town) with the attendant load/demand variances and thinking about how a wider scope grid with multiple generation sources functions. But if you think about one coal plant serving a local demand – perhaps like a town/municipal plant might have run in the past and even some today still in existence it distills the issue to a more simplistic concept. Most towns that had those coal plants did not have other generation sources to “top off” the coal plant with intermediate/peaker plants. They just had their one coal plant – that ran 24/7 at an output sufficient to cover any demand during that 24 hour period. Those plants ran at maximum output 24/7 including at times when demand was lower than what the plant was capable of generating. So how did they operate at those times when demand was low? I think they probably had multiple turbines – and some of those turbines were just not energized… and sat idle… There had to be some mechanism to shed the generation that was excess to the demand. So how was that done? LG, at the risk of oversimplifying, let me put it this way. With a steam-powered generator, the boiler can’t make less steam than a hefty minimum amount even if the turbine(s) are spinning with no load; that’s the unit’s minimum fuel consumption. Use it in one or more steam turbines or dump the steam (vent it off) but you cannot make less steam and keep the boiler operating. With a combustion turbine, where the heat is created inside the turbine, you can back down the consumption of fuel along with the electrical output (although exhaust heat recovery processes such as “combined cycle” are less flexible). That’s why CTs are considered cycling units. Most steam turbine plants are baseload ( coal or nuclear) so they run 24/7. They are not designed to be cycled if solar generation eats into their place in the daily generation lineup. The very oldest generators, however, were simply big diesel or steam direct- drive engines like railroad locomotives. They could be cycled: the boilers were small enough to start up quickly, and the might have to vent excess steam but not for long before they’d cool. At best they were not very efficient, and high maintenance. Yes, there were early, smaller coal fired turbine plants — but they were paired with cycling units of some kind – frequently small hydro. Nobody intentionally built a non-cycleable generating unit without sufficient cycling capability on the same minigrid. A generator can spin with no load. Some generators require a small amount of load to operate, but yes you can for the most part back off how much load a generator carries. But now you are wasting fuel at least in the amount of the minimum consumption of that unit — and you may even have to vent steam to stay spinning with no load. The grid operator will pay a certain number of generators to do this, deliberately, so as to have a few generators read to pick up the load immediately if something interrupts other sources of generation (like a generator emergency failure, or a critical transmission outage). But if not one of those, why would any other generator keep on consuming fuel for no energy sales, no income? You can always shed generation instantly! But then, if your fuel consumption for that generator falls below the point at which its boiler is stable, you must, always, divert the process that was powering the generator into shutdown and/or vent mode. The comments on this website provide useful context for how to assess and control the risk of today’s rush to integrate wind and solar into today’s grid. 2/ the excessive consumption of land by arrays of solar panels and wind towers that will degrade the lands future use, its value, and its environment, and thus harm and limit its use by citizens, not only locally but throughout entire regions. These comments confirm the substantial risks where there are great complexities and uncertainties in how to address these risks, particularly when doing things never done before in a rapidly changing world. The strong financial and market incentives to falsely solve existing problems by the imprudent acquisition and use of large wind and solar farms in a quest to gain quick market share by tying up large swaths of cheap land, respective of location and the adverse impacts that arise from from use. Take for example the proposal to locate such farms on Virginia’s Eastern shore despite the obvious imprudence of such an endeavor. Larry wonders if that ballyhooed Amazon project had finally been dropped sometime after the consummation of the deal had been announced? I hope so. I would be a sure sign those in charge were thinking more clearly. It’d be a sure sign those in charge were now thinking more clearly. After the electrical system shifted from Edison’s direct current model that served neighborhoods with small units to Tesla/Westinghouse’s alternating current, transmission lines existed between load centers that could import or export excess generation to other areas. Don’t try and oversimplify. Electricity does not work like a point to point road system. Acbar once described it very well. The electricity system is like a big bathtub with generators putting water in with medium and large-sized pipes and many, many customers are taking water out through tiny holes. The grid operator’s job is to make sure enough water is going in to supply all of the water going out. This changes throughout the day, week and year. The smaller pipes that are easier to turn on and off are the cycling and peaking units that have historically been used to deal with variations in load. The grid is getting far more complex and now requires more complex and sophisticated means of managing it. Coal and nuclear plants are not able to alter their output easily, as Acbar explained. Owners of nuclear plants want them to run all of the time so they usually bid them into the market at zero cost, so they will always be dispatched. Coal plants present more of a problem because fuel costs make up a larger share of their overall energy costs compared to nuclear. The low-cost of natural gas during the past few years has made it difficult to run all but the newest and most efficient coal plants at a high capacity factor. Renewables participate in a different auction than do dispatchable units, but they are favored by grid operators because their output has a zero marginal cost. With a large amount of solar, such as in California, this can cut into the need for conventional units serving the baseload during the daytime. This has caused the retirement of aging, uneconomic nuclear and coal units, and even the bankruptcy of some relatively new merchant gas-fired plants. Low cost storage using batteries, EVs, and perhaps some pumped storage can be used to maintain the efficient operation of these “baseload” plants, but this is a time of transition in the energy system and investors and utilities are trying to protect the profitability of their existing assets. We have lots of ways to deal with load variations. It comes down to who gets paid and who does not. The experts familiar with the grid and the available solutions are not concerned about reliability due to greater use of renewables. Much of the concern that you hear about is coming from vested interests who are no longer as profitable as they hoped under these changing circumstances. They are using political and regulatory means to tilt the playing field in their favor. Challenges remain for developing a modern energy system, but we have an increasing number of innovative, low-cost solutions to those challenges. With more involvement of technical experts and experienced regulators and less influence from political manipulators, we will have a modern system that benefits everyone. Likely, it is too easy to take my comments as anti-renewable energy. They are not, but only question how we get there if we can. As stated earlier, I do have major problems with wind, particularly west of Mississippi River, and feel wind towers farms should be limited to few places. As to how do we get there with solar? Grid resistance and reliability is far above my level of expertise to judge in general or particular. Here, what I really fear, given all our past experiences, from roads to strip centers, to cars or battleships, is that undue risks and bad decisions, on all levels of business and government, will be made far too fast for political, ideological, and financial reasons, and for special interest reasons that push certain kinds of solar too far too fast, gobbling up other options and opportunities, by doing it the easy and cheap way, for the advantage of a few intent on gobbling up the market at the disadvantage of all of us. Here we will get far too much of the wrong kind of solar far to fast technology wise, environmental wise, and land development and preservation wise. So we are struck with a series of big mistakes that hobble us and our children for generations. The result being that too many places in Virginia will be saddled with big solar projects that limits how many residents then can use their land and region in the future, and that will adversely impact the value of the land, not the mention their right to live in a place that is not littered fields of glass and steel, an modern version of Henry Miller’s air-conditioned nightmare. Remember too that no land is waste land. A highway median strip is a precious resource today, preserving species, so are vast deserts, dunes, and beaches. The Amazon deal on Virginia’s precious Eastern Shore should be everybody’s wake call. Do no harm. Do this right for everyone. Not the few. The good new is that land done right is very malleable. Some of the most beautiful mountains in the world are heavily populated while also heavily enjoyed by hordes of people, from near and far, as an outdoor natural resource. The tool of “out of sight, out of mind” is also a powerful tool of development if done right. Solar in cities can likely be far more intensely developed than we imagine now, once we apply our skills and imaginations to the problems, including not only technology breakthroughs that solve land cost and size issues, but zoning problems. How much better is that than a horribly inefficient wind farm in Accomac county. One that ruins the county’s environment along with its future that is on the cusp of enormous positive change that builds on it past and present, instead of destroying both. And that goes for many other open places in Virginia as well that now are likely getting the bums rush for steel and glass covering thousands of open acreage, ruining other uses. in terms of land needed – to compare fossil fuels to solar – you need a fair apples-to-apples and I do not think many folks live near where coal is actually mined , transported, and burned to realize just how much land it uses – and the visual – and environmental impacts – not only emissions but coal ash disposal.. If you go to WVA and look at how land is “used” to mine coal – I’m pretty sure you’d find solar use of land quite less intensive. You need to also include all the sites where coal is transported to and stored. Excellent point Larry, and I’ve made it too. That’s why we should not allow the same thing in many practical aspects to happen yet again with solar or wind farms. And surely it may well based on what on going on now. Those statistics as to possibilities in play are easily found as I suggested to you earlier, and as many other knowledgeable people attest, including on this website. One bright spot is that there are many remedies here, remedies that working together might well prevent abuse. Thus, for example, if Amazon and UVa. say they want to use solar, then why not actually require them to really use it and require that they build those solar panels on their property to served their needs, instead of claiming to use it while forcing its production into someone else’s neighborhood, like is happening for example in King William County. I have said before that I agree with you about utility-scale solar. I think most most solar should be on buildings, parking lots and other disturbed land uses. Not on farms in rural areas. There are many benefits to distributed generation. It is the utilities desire to own it all and control it all that is causing this type of solar development, not the character of solar itself. There are many varieties of solar under development that will be an integral part of buildings, rather than an add-on. I have the same concern that you do, except it applies to overzealous development of natural gas-fired plants. From a climate perspective these plants are the same as coal plants. They put us on an path of increasing energy costs and require fracking and pipelines and other disruptions of our communities, lands and waters to make them possible. If we were honest about it, we would realize that we don’t have to rush forward with any technology. Demand is not growing. We have a surplus of generation. We have time for thoughtful consideration, and can allow a variety of options to develop. It is the hunger for more revenues and profit that is driving this frenzied rush for “more”. We cannot keep stuffing our cities full of people, while covering up the farmland and environmental services that make them possible. The data centers do not occupy much land. Certainly not enough to generate the amount of power they need, but they should self-generate as much as they can, but the utilities don’t want that. They want to own it and put it in the rate base and control the entire transaction. Having self-sufficient customers scares them. Land is “used” for a wide variety of things .. huge amounts of land – that we mostly take for granted. I don’t hear too many folks saying that we should not use land for sewage treatment – both at the edge of a city but also millions of gallons of sewage sludge on farm fields that lie just out side the beltway. Ditto for landfills.. We have both 50 miles south of NoVa and I’ve never yet heard any NoVa folks opposed to either as a “bad” land use. Then you need to go on to interstate highways, railroad rights of way, pipelines and powerline rights of ways. Then you also need to include farms – especially the ones that raise poultry, hogs and cattle to feed NoVa . Down our way – every year, we have folks who live next to the fields that Blue Plains Sewage Sludge is spread on… it’s not pretty and it stinks to high heaven and it runs off into the local waterways if it is spread without regard to weather conditions.. Not an ounce of it comes from our own county – it’s all from NoVa and yet I bet virtually no one in NoVA actually realizes that their toilet essentially gets spread on farm fields far from their own sight and smell!! What if NoVa had to absorb it’s own sewage sludge within it’s own region – where folks WOULD see it and be aware that it actually is an impact that they themselves create? I’m just pointing out that most all trappings of “civilization” DO have impacts to land – and often apart from where folks actually live and I include electricity – from fossil fuels, nukes, and solar/wind. None of these fuels are without impacts to land. we just need to recognize that solar is not some high impact fuel as compared to other fuels. They all have impacts. A little knowledge is always suspect in a sea of complexity and unknowns. I hope others will chime in here, say what’s right, wrong, incomplete, or foolish about these concerns, and suggestions below. The comments of others above provide valuable context to the challenges and opportunities presented today by solar and wind power, its rapid injection into the marketplace that 9 months ago represented a 2% market share nationally. So it is only natural that there are many gaps in the public’s and industries knowledge and experience about what is really going on now, the consequences and risks of a massive and rapid increase in the share of wind and solar generation in the electric grid. This lack of knowledge and its potential for adverse consequences has surfaced abroad already where governments and industries proceeded too fast, Germany being a notable example. These are major issues. Much is at stake. Changes on the horizon may well be as consequential and disruptive as the advent of the steamship, railroad, telegraph, or automobile. These articles typically get vague quick on the consequences of these inefficient uses of land, or on the ways such inefficient uses and their consequences might be diluted or avoided. So it is difficult to divine the drivers of these wildly different estimates – what they mean in terms of consequences, and related issues like the cost, reliability, and collateral impacts on all sorts and kinds of citizens, whether consumers and others simply living in or passing through the neighborhood. Not to mention how Virginia might gain the best advantage of solar and wind while best limiting its risks and short falls, and preserving its future options to deal with a sea of unknowns, and the rapid emergence of ever more disruptive technologies that leave last years fads and cutting edge innovations as stranded costs. So, for instance, we arrive at an obvious question. How best can we judge land impacts within Virginia should solar and wind rapidly increase market share in the near, mid, and long term? How best can Virginia manage this change to the best advantage of all concerned in a fair and practical manner, that leaves Virginia with the maximum tools and flexibilities to deal with future change, including change that threatens the suddenly threatens then status quo, as well as its most recent plans. This appears to be a particularly important question today given that there are apparently significant financial and market share advantages afforded to developers of energy who positioned to quickly build large utility wind and solar farms out in rural areas that are relatively far away from the demand for such energy. Why? One driver here might be the need to tie up as quickly and cheaply as possible the “best” land sites for solar panels and wind towers in the State. Indeed this aggressive action might be essential if one is to gain and keep as much market share as possible. While surely circumstances and challenges differ by location and need, the overarching theme might be to gain control of large parcels of cheap land (the closer to existing transmission lines the better) that allow relatively easy permitting and quick construction, by reason of low population areas combined with a low percentage of politically astute or active local citizens, or an area controlled by a few special interests. Here I can only speculate, given what I know and don’t know. It’s also been suggested that the introduction of solar and wind above a 30% share of the applicable grid is problematic. It may threaten the required reliability and resilience of the grid. If so, then new wind and solar might well be capped at 30% until, and if, solutions are found by technology that resolve storage issues, and/or otherwise lowers the price, and increases the efficiency of, closer in smaller production units installed far closer to the demand for electricity. Likely other new solutions will be needed to gain this additional penetration beyond 30% of the market share – new zoning issues, design and function issues, a host of innovations throughout the infrastructure of the grid and the way it is managed and the public acceptance of energy production “in their own back yards,” not to mention major alterations in the fabric of cities and towns, its buildings, utilities and related hardscape, software, and institutions that build and manage them for private gain & public interest. Plus, the success of each new project and its new technology, whether rural, suburban or urban, will depend on a host of other evolving matters and demands, including an array of new local and regional site issues, such as ever changing weather, design needs, great differences in transmission distances and facility size, plus an evolving mix of the other types of production on the grid, both new and old, including breakthroughs that render newly introduced solutions abruptly and unexpectedly obsolete. Any of these particular concerns may or may not apply to the electric power revolution at hand. But a host of unexpected problems and unintended consequences will show at our table, short and long term. This will surely happen if solar and wind generators gain the market share forecast by its proponents. And great loss will be incurred, absent strong planning, implementation, and management. Huge long-term mistakes are often the norm is such revolutions. Like the great failures of urban planning that began in the 1950s, lasted through the 20th century and carried over into the 21th. Gridlock shows up most everywhere in America now. Northern Virginia outside the beltway is a prime example. Here a revolution driven by private interests, and government mistakes, and lack of competent regulation, created a transportation debacle that couldn’t be checked, diluted or reversed in time. It’s left us intractable problems over the past 50 years that will haunt us for decades more. True, Virginia is said to have one of the best electric grid and electric operations in the nation. One at the top of the game after a long history of competence, stable performance and success, so what might change? For one thing, the way this electric business is done in Virginia and who manages it might change greatly if some proponents of wind and solar power get their way. This may be good, or not, but for sure it will insert another ingredient of risk into the future of electric power in Virginia. How to manage of this? What should change? What should not? I do not know. But I do think that the public ought to have are more accurate and reliable information on what is going on. And how their lives, fortunes, and futures might be directly impacted on the ground by these changes, and how the inevitable challenged are to be managed for the benefit of all citizens, not just a favored few. Reed, we are in violent agreement, here. Your environmental and land use concerns are often neglected, indeed, at our children’s peril. At the practical level, however, what’s missing is a fair method for weighing the value and cost of electric generation so that environmental and fuel costs are both considered as costs, along with the resulting energy price, local economic and employment gains, etc. Quantifing the dollar “cost” of an environmental impact such as agricultural land loss, or the unsightliness of a field of solar collectors, is hard to do. And, unfortunately, the regulators charged with weighing those costs and benefits all too often ignore (or are blamed politically for considering) any cost they can’t quantify, because it’s “too subjective.” That does not make such costs any less real. We can talk about the costs and benefits of any particular generating plant, but I agree with others here, those costs and benefits need to consider all the support facilities and the mining and transportation impacts that support fuel delivery, and the transmission that takes away the electric product. The impact of making electricity must include the total impact of the entire process, not only the impact at the generator site. That’s the only way to compare options. Solar power has a big footprint and it is not exactly pretty. Spread out over a field, it’s easy to regret the loss of all those growing things. 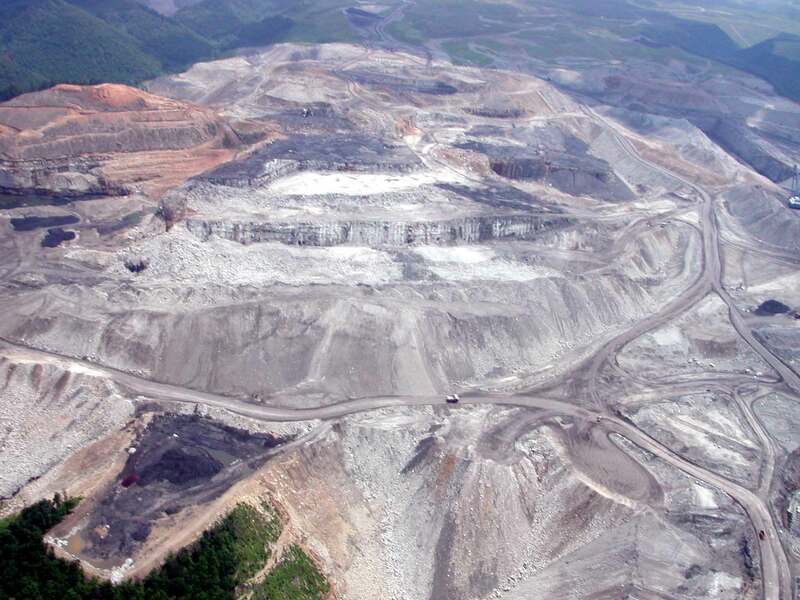 But LG has a point with his picture of a strip mine — coal can be worse. And as I have mentioned here before, solar has the relative advantage that it is reversible at low cost — those collectors are easy to remove and the land underneath is not left polluted. I agree with your suggestion that there’s a bit of a land grab going on as solar developers seek out the best locations: where land is cheap and a power line with extra capacity is nearby. It’s helpful to get out of your thinking that proximity to load has much importance any longer. Once the electricity from a solar generator is uploaded to the grid it is, effectively, “everywhere” on the grid simultaneously for purposes of who buys it or uses it. The only things that matter to the developer are: 1. cheap land, and 2. a cheap grid interconnection ( i.e., an existing transmission line). In addition to utility and environmental regulation, you would simply ban solar generation in some places as a matter of land use. We should discuss, how else should best use of such land be decided, if not by what it will sell or lease for? If the solar developer is willing to pay quite a bit more in annual rent than the farmer made net on last year’s crops, why shouldn’t the farmer take the offer? Much of the land I’ve seen under development was not being farmed at all but cleared from scrub growth. Is that better than a strip mine, even if the mine is 200 miles away? I remain strongly in favor of integrating solar collectors into the design and layout of malls and apartments, not to mention those huge flat-roofed buildings such as Walmart distribution centers, where the incremental cost would be low. Private homes can easily support enough solar generation to cut their bills substantially. But, to get there, first we have to have a familiar technology, and second, a demand from customers and landlords who want this added to their next building, and third, a more cooperative set of building codes. Until then I think most solar development in Virginia is going to be in those fields, out in the country, where you and I see and feel the loss. And this is why we must do all we can to limit and control that “Loss” while also at the same time gaining maximum advantage that each circumstance allows. It’s easier said than done. Like you also say, these are not decisions left to engineers or involved special interests acting alone. Quite the contrary, these decisions need be made out in the open in public forums properly prepared to assure that such decisions serve public interests. At base, these are political decisions, zoning and land use matters, where everyone’s rights need to be protected, weighed in each case against other interests pursuant to well crafted laws, regulations, as well as all the equities of the matters at hand. Why? As you also point out, some things are hard to analyze and quantify, much less judge. So safeguards must be put in place. It seems to me that this holds true in the case of most all projects. But let me try to illustrate the point with two examples, however dramatic, that come to my mind. Likely you are familiar with this great natural resource, 32, 000 acres with 47 miles of hiking trails across a plateau mostly over 4,000 feet high. Dolly Sods is one of very few places east of the Mississippi where one can experience arctic tundra wide-open lands whose views match the high plains of the American West. Here, in West Virginia, this wilderness is 13 miles long and 6 miles wide. Wildly changable weather dominates or can easily dominate visitors entering this place. Like ALL places, Dolly Sods changes lives. Here is a point relevant to our mutual concern. Hiking Dolly Sods, a true wilderness for their first time, young people can first pump breathless up a steep mountain trail alongside Red Creek and atop the plateau head due north another 11 miles across tundra with views for miles in all directions until, going over a low ridge, they will be startled as everything abruptly changes. Down below in a bowl then, the Mount Storm Power station will confront them, jolting them out of a priceless experience. But, most importantly, they had to crest that ridge after a very long arduous and wonderful hike before the big coal plant “soiled the life changing experience of Dolly Sods.” There is a paradox here. That bowl gave them a magnificent gift. Had that power plant been sited anywhere but in that bowl at its plateau’s far north end, the Dolly Sods experience would have been ruined for generations crossing those sods. This is a melodramatic example. But I think it applies in different degrees, but in important ways, to each and every land use decision, where it is large or small. When mistakes are made or things are not done right, everyone and everything of value can easily suffer. No land is wasteland. All land deserves respect. The consequences of land use decisions, good or bad, are most always cumulative. The consequences easily spread out near and far, and they easily last generations. At the same time, those consequences can be greatly enhanced or diluted, for good or bad, by small details, that can have enormous and lasting consequences. Often too, these details are simple and obvious to fix. Yet people are very often unable, or are unwilling, to see them, or act on them. Here is another example, Virginia’s Eastern Shore, this one a very obvious big mistake that far too often happens, although it never should. Here I touch briefly on this narrow and fragile peninsula that is 70 miles long and 5 to 10 miles wide. All of it lies between the Chesapeake Bay and the Atlantic Ocean, but it has far less hard build-able ground given that the peninsula is indented with a countless series of creeks, inlets, estuaries, and marshes. So by road the Peninsula’s access is extremely limited. US 13 that runs though its center gives the primary access from the Maryland line to the Chesapeake Bay bridge tunnel on the south. This road is flat and tells the traveler little. Most drivers never see or imagine what they are blindly throwing away by not stopping and looking around. They typically got no idea that five universities are there to study the peninsula’s fragile ecology and will never see and understand the critical role that landscape plays in protecting the geography of the Middle Atlantic States, and how it is helping us unlock secrets so we will learn how to arm the nation’s coastal regions against rising waters and global warming. And that is not the half of what the guy passing through will often miss. The Peninsula’s entire length, both its bay and ocean sides – their barrier islands, beaches, and bays and estuaries, sustain one of the largest arrays of fish, waterfowl, crustaceans, and shellfish on earth. It’s critical habitat for the locals and for migratory birds on North America’ main coastal eastern flyway headed from the Arctic to South America, twice annual spectacles that draws birders, hunters and avian scientists from around the world. Obviously too there is enormous potential here for tourism – for sportsmen, beach goers, naturalists, boaters, retirees, second homeowner or whatever. The peninsulas rich history and its unique culture, built over the past 400 years, compound these opportunities. What has happened here has shaped American history from earliest colonial times, most of America’s wars, much of its commerce, and its governments, and its nearby states, and this local history did so in ways almost without equal. Plus Virginia’s eastern shore tells us much about where these people came from. The interaction between events on the eastern shore and Europe is quite remarkable, so the place should be a strong draw for European visitors. But all communities wax and wane over time, often dozens of times within a single century typically, not to mention 400 years. Virginia’s eastern shore has been on the wane economically since the latter half of the 20th century for complex reasons – declines of fishing and shell fishing stock, the decline of the steamboat, and its replacement by the railroad and then the automobile, for example. Now a new study by Virginia Commonwealth University reinforces a common local complaint. The cars on Route 13 too rarely stop there anymore. Too many would be tourists and visitors just keep going on up into Maryland and Delaware, or down across the bridge into Norfolk and beyond. Like I said earlier, the road is flat and unattractive, they say. It gives the visitor little or no reason to stop. Nothing catches their attention. Too few see or know that they’ll encounter a wonderland of unique opportunities and surprises hidden a short distance off the highway. So the study suggests how a plan to bring tourists interested in history may help spark a Renaissance on Virginia’s Eastern shore. This idea is now far more than idle speculation. It’s plainly obvious that the peninsula’s southern most town of Cape Charles is coming alive with flare, and has been some time. Renovations to the historic town – new shops, restaurants, storefronts and parks – a splendid new commercial resort by the bay north of town, an exquisite planned and growing residential community on the south side. And, outside of Cape Charles, fine estates far back off the roads lead to waterfront homes that are coming back to life, or never lost it. But in most cases, few outsiders will ever know all of this unless they come or pass by in a boat. So the VCU Study is timely and it makes a good start. Perhaps what is needed now is a comprehensive master plan that pulls all the waiting pieces of the wonderful region together to jump-start its future. But it seems plain to me that big wind and solar farms are not one of the keys to the Virginia’s eastern shores future. Is it not likely that such big wind farms built there now will quite likely throttle the great opportunities that these communities might now otherwise have within their grasp. A dramatic example again, but the point is that expansion of wind and solar must be done slowly and with prudence if we are to avoid major long term mistakes. We do agree. As a matter of background, I used to be an active white-water and flat-water canoeist (until heart issues) and love the unspoiled waterways I’ve seen over the years, and the desecration done by unthinking development is all the more painful, especially when it’s plainly (to an outsider’s eye) counterproductive. The sort of responsible, environmentally-sensitive approach that most people actually hope for, and that is attractive to residents and tourists alike, seems never to occur to some developers, or if it occurs to them it’s too capital intensive to afford, and by their slovenly approach they harm the environment for everyone else. When I travel US13 I can’t help but compare it to, say, US1 north of Brunswick, ME, where traffic can be just as intense and the roadside commerce just as thick yet it’s rarely as trashy in ME as in MD and Virginia. People in Maine seem to care more. In contrast, think of US301 through Waldorf/St. Charles, MD! What I was trying to suggest is that it’s very difficult to turn subjective environmental judgments over to bureaucrats. They need clearcut criteria to administer that set go/no-go parameters and conditions (for example, a setback of how many feet from the highway, screening from roads and homes of what kind and amount that must be planted, provision for wildlife passage and people trails through large sites, complete cleanup required and bonded if the site is ever abandoned, and a public hearing before approval to let citizens with unforeseen concerns voice them), applicable both to the solar collectors and to support facilities. With these requirements on the books even an idiot can tick them off to his financing parties and to the regulators; reasonable economic development will still occur, development that doesn’t appall or scare off the tourists. The State Corporation Commission, for example, is charged by State law with considering the environmental impact of its decisions on such utility matters as the siting of generating stations but its criteria for how to balance that impact amidst dollar-denominated cost/benefit considerations are quite vague; and as for solar generation, the GA in its wisdom exempted most solar development (even the larger utility-scale plants) from any SCC review at all. It bothers me that so often, we hear local officials talk about refraining from specific, up-front regulations of land use because they’d encroach on private property rights. Wait a minute — don’t the rest of us have rights too? To a decent environment, and a tax base that’s growing because of sensible, sensitive economic development? I don’t think regulation to those ends, not done to excess, is either anti-conservative or anti-libertarian at heart. One of the oldest towns on the eastern shore is Eastville (Northampton CH), and I own a home just across the Bay in Westville (later renamed Mathews CH). I would not be pleased to have a big solar development across the road from me there in Mathews. Yet I doubt anyone would build one there; anywhere near the water the land is too expensive when compared with the interior of Mathews County, which is basically one big barren gravel pit; it’s good neither for crops nor livestock and barely suffices to support pulpwood pine farms (or scrub) and a handful of hunt clubs; there are no homes there. I won’t lose sleep over solar development in that part of the County. Yet, because there are no people there, there are no transmission lines either. Now, how do I influence the County government to make sure that solar generation facilities are built in the hidden interior of the County and not next to the transmission lines that keep my lights on? One way is to convince another player in this, Dominion, to build a transmission line where there is none, right into the middle of the Mathews gravel zone. Ah, but no one will pay for it up front. . . . but if it were there, it clearly would attract solar developers. NOW we’re talking about what Dominion really could do to help steer the development/land use process responsibly (and make money too). Thus we might open great opportunities in novel ways that recoup the cost of new transmission lines many times over, while we save land elsewhere that otherwise has far better uses and/or potential without solar panels. Not sure this works, but it does it’s win win for everyone. You raise many important issues. Virginia needs to develop an appropriate forum for their discussion. This is not an issue just for one or a few utilities to decide, it has much larger ramifications than that. We should not default to an extension of 20th century solutions out of a misguided sense that continuing the old approach will somehow avoid problems or add to reliability. Making that choice out of fear or lack of thorough evaluation could cause far more harm than good. The new options of renewables, storage, 2-way digitally controlled grids, etc. are technology driven not fuel driven. As such, they will have an experience curve where significant improvements and cost reductions will occur in a few years not over several decades as has been the experience with fuel-based options. This rapid rate of change plus the decoupling of load growth with economic and population growth is transforming our energy system whether we desire it or not. Failure to accept that change is happening is not a successful method of coping with it. There is a concerted effort by groups who have espoused market-based responses to regulatory issues, to abandon that concept now that they hold the reins of power. They wish to prop up aging technologies such as coal and nuclear that economics and the needs of the modern grid are saying are a bad fit for the future. There is also an established industry effort to slow down acceptance of solar through the imposition of tariffs (a reverse subsidy) on solar that will favor established technologies during the final few years of the solar ITC. You are absolutely right that we need an open and thorough evaluation of these issues. But we also need to consider the proper role of our utilities. In none of the options that are currently under consideration, do utilities relinquish their responsibilities for reliability and for maintaining and improving the grid. The essential questions is do we want to hamstring the utilities by keeping them under the 20th century model of regulation or do we wish to increase their opportunities and that of other independent businesses to innovate, lower costs, and create jobs? Reliability will always be scrutinized and closely regulated. But holding onto a “build more to earn more” utility payment formula will lock us in to 40+ years of 20th century technology because that will be the only way for shareholders to prosper. And the ratepayers will pay dearly for it. There is a way to have what you ask for, but not by using preconceived notions, or favoring special interests at the expense of the public good. The decisions about the nature of our future energy system will have long-term consequences and should be approached in an inclusive, transparent and very thoughtful manner. Eleven former FERC commissioners filed comments calling the request by the DOE to subsidize coal and nuclear plants “a significant step backwards” for the agency. Nearly 90 percent of the nuclear energy support would go to five companies — Exelon, Entergy, PSEG, NextEra and FirstEnergy — while NRG, Dynegy, FirstEnergy, American Electric Power and Talen Energy would receive 80 percent of the coal subsidies. Many question the premise that these power plants need to be kept on-line. The ISO/RTO Council, representing the nation’s grid operators, expressed concerns that the rule could degrade reliability if it blocks the use of cost-effective alternatives to nuclear and coal.